"The path to your right of way needs"
Sendero Acquisitions, L.P. is a consulting firm that provides project management, acquisition and relocation services to public agencies, non-profit and private companies. Sendero Acquisitions offers complete right of way and real estate services for projects that are large and small using federal, state and/or local funds. The goal of Sendero Acquisitions, LP is to provide the highest level of professionalism and expertise to our clients and to extend these characteristics to the owners and occupants within the project area. 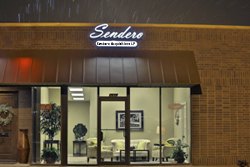 Sendero Acquisitions, LP is headquartered in Abilene, Texas. With offices in Abilene, Katy, El Paso, and Edinburg, Texas our company does acquisition and right of way projects anywhere in the US. Our principals are Mendy J. Baird, Charles M. Davis and Carlos Lascurain. Sendero Appraisals, L.P. specializes in right of way valuation, consulting and litigation support. We have performed hundreds of right of way appraisals involving both fee and easement acquisitions including highways, pipelines, electric transmission lines, sewer lines, water lines, transportation corridors, and mass transit projects. Our firm has appraised various types of easements including subsurface easements, above ground easements, aerial easements and temporary construction easements. As part of our assignments, we have performed studies to determine possible impacts of the proposed acquisition on the value of the remainder properties. We have appraised all types of commercial, retail, industrial, residential, and agricultural properties. Our appraisal assignments have included multi-story office buildings, medical offices, retail properties, shopping centers, automobile dealerships, hotels/motels, restaurants, convenience stores/service stations, auto repair facilities, office/warehouses, industrial flex buildings, mini warehouses, showrooms, manufacturing facilities, churches, single family residences, duplexes, apartments, residential lots, subdivisions, agricultural, and vacant land. Copyright © 2006-2018 Sendero Acquisitions, LP All Rights Reserved.